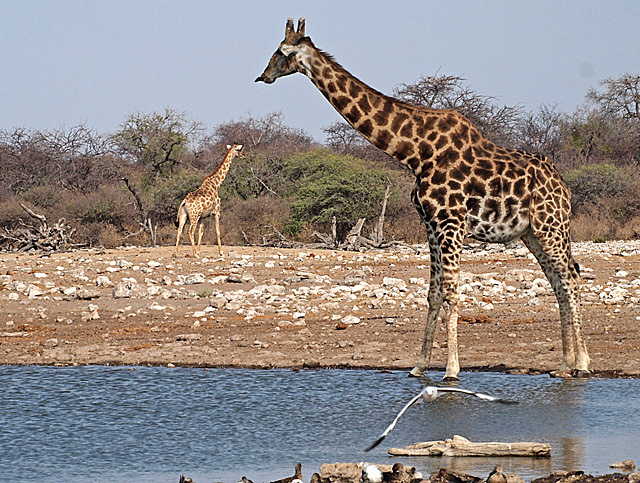 The Giraffe is the tallest of all land-living animals. It is between 5 and 6 meters tall and weighs between 830 and 1200 kg. Swedish Calr Linnaeus first described the giraffe in 1758 and gave it the name “Cervus camelopardalis” in the 10th edition of his Systema Naturae. The name camelopardis is thought to come from the head looking like a camel and the spots resembling those of the leopard. It is a very special animal in many ways. The neck is extremely long. and can be well over 2 meters. To be able to pump blood all the way to the brain the giraffe’s heart is exceptional. It can weigh 10 kg and be 60 cm tall. It’s blood pressure is about double that to other average large mammals. In the upper neck is a complex pressure-regulation system. 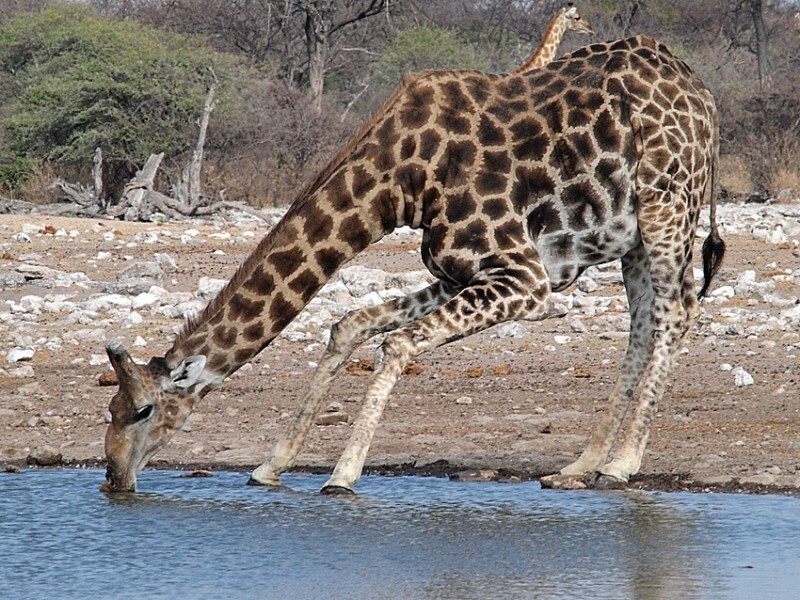 Thanks to it the giraffe can bend it’s head to drink and still prevent to much blood flowing to the brain. 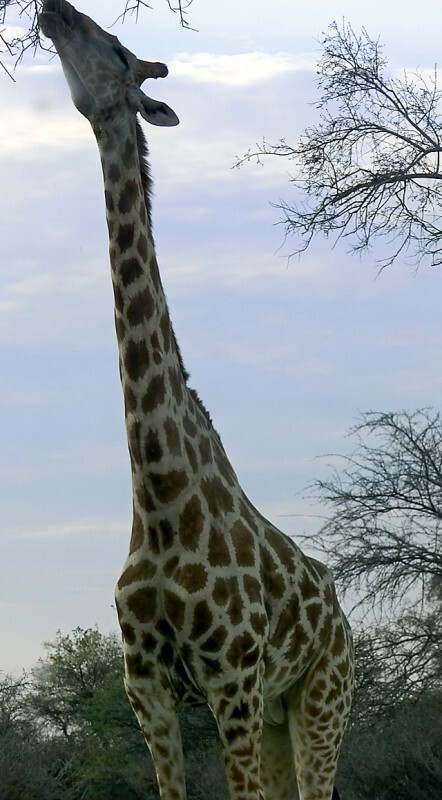 With such a high blood pressure the giraffe could have a problem with too high pressure in the lower parts of the legs. To handle that pressure the giraffe has got a very tight sheath of thick skin over their lower limbs. It can be compared with the fighter pilots g-suit to handle extreme g-forces, resulting in high blood pressure in tight turns. The giraffe is found in Africa from Chad in the north to South Africa in the south. They inhabit savannas, grasslands or open woodlands. They prefer areas with plenty of acacia trees which are important food sources. Their length helps them reach part of the trees that are unreachable to others. 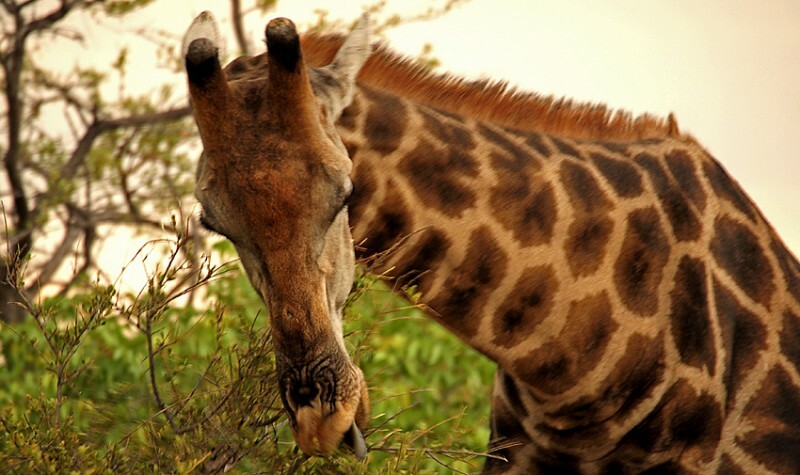 In Etosha we found giraffes all over, alone or in small groups. On our last eveneing in the park we went to the waterhole at Klien Namutoni. There we saw more than 20 giraffes coming for an evening drink. 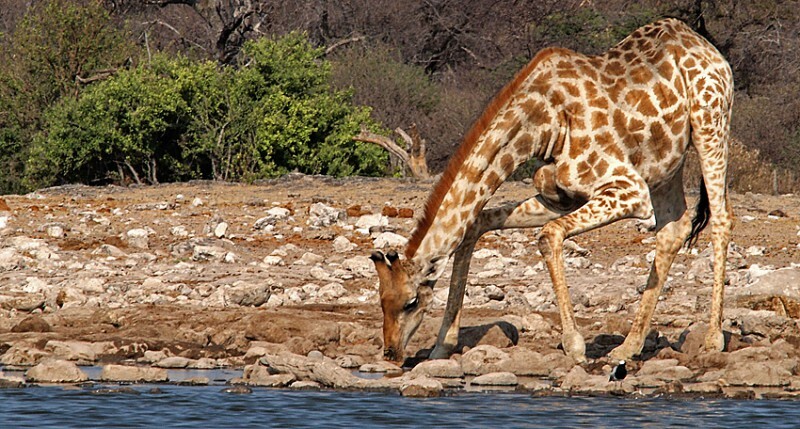 So, how do you drink when your head and mouth is 5 to 6 meters above the water? …and the other way is to spread the front legs. 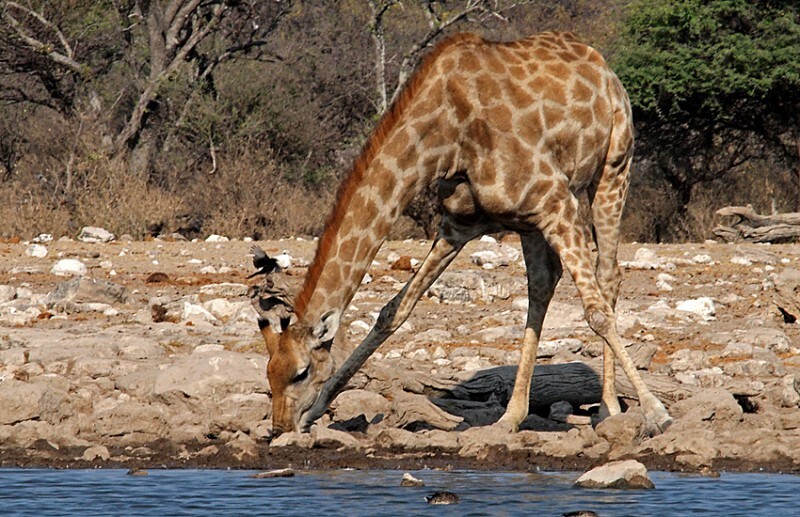 Male giraffes use their necks for combat or even homosexual courtships.